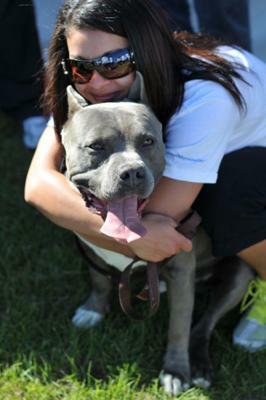 Blue and i were brought together by chance, I never imagined owning a pitbull. Blue is a 2 year old male, I rescued him from an abusive home when he was 13 weeks old (cocaine addicts) my lil man was near death and it cost me thousands to save his life. Blue and I are like one... everywhere I am he is with me, work, garden, and running. We hike every weekend in the Banff and Kananaskis national parks of Alberta. Blue has many friends mostly females, he loves to play and run around, and chase balls and play tug. My 5 year old nephew and 9 Year old niece walk him all the time for me, sure I get interesting looks as we walk down the street, but he walks with pride, and doesn't pull, or cause any problems. He is truly my blessing in disguise.. I love my dog!!!! I would never not own a pitbull ever again!